As you'd expect, this 13-inch MacBook Air is a performance powerhouse yet it is lightweight and portable. The internal workings of the MacBook Air make it the superb performer that it is. The 1.8Ghz Intel i5 Dual-Core processor keeps things humming along in seamless fashion, with the 8GB of RAM allowing you to multitask with no problems at all. Add in the 128GB of SSD storage for high speed data access and you have a device that performs at an optimum level when you need it to. All that performance requires serious battery power and such is the efficiency of this laptop that you can expect up to 12 hours on a single full charge. 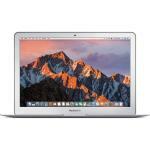 The MacBook Air’s performance and power are fantastic for playing games but the display resolution of 1440 x 900 pixels plus the Intel HD Graphics 6000 utility, and the enhanced graphics it provides, takes the gaming experience to another level. Video calling is much better when you do it on the MacBook Air, thanks to the 720p FaceTime HD camera. The MacBook Air's Thunderbolt 2 port allows for instant sharing and transferring of data. The MacBook also supports dual band WiFi connectivity and can sync with AirPort Extreme and AirPort Time Capsule with ease. Plus, the advanced Bluetooth technology allows you to connect to Bluetooth-enabled devices with the utmost ease.